I was brought up on the book of Winnie the Pooh and slightly resent the red-jacketed Disney version. I remember, in particular, being confused by the identity of the Gopher who appeared at the start of “the Blustery day” but, of course, I was utterly charmed by the way the text blew across the page, or the way in which Pooh climbed the honey tree. There is also alot of charm in the detail of the animation- Pooh actually moves like a stuffed animal. It is joyous in a purely technical way!! Somehow, I associate the “Honey tree” film with “Mary Poppins” though it may have been screened with something like “That Darn Cat” and perhaps one of these early 60s films was screened together* (I’ve just been told it was “the Ugly Dachund” though I do not remember that film at all!). However, there are many incarnations of Pooh. There is EH Shepard’s original. Like Tenniel nearly a century before, Shepard had been plucked from the pages of Punch to do children’s illustrations and he was excellent at it. Indeed, his illustrations to both “Pooh” and “Wind in the Willows” are almost inseparable from the original text. In the early 70s, Shepard oversaw a colourized version of both books. Shepard had come out of the First world war and pretty well straight into illustrating Pooh. During the war, when he was decorated with a Military Cross for valour at Passchendaele, ( “he continued to observe and send back valuable information, in spite of heavy shell and machine gun fire. His courage and coolness were conspicuous”), he was sending back cartoons to the British press. He continued as head cartoonist at Punch until Malcolm Muggeridge pushed him out in 1953. The pooh Shepard illustrated was based on his own son’s bear “Growler” and not on the bear owned by AA Milne’s son Christopher Robin. In time, he grew to resent Pooh, though that might have been because of associations with his son who died in the 2nd World war. So well-known are these films that many Russian children see this as the authentic “Winnie the Pooh”. It has charm certainly. As curiosities go, here is a link to a version done by the puppeteers who provided “The Lonely Goatherd” in “The sound of music”. Just look at the length of the stings on the Pooh puppet when Christopher Robin is on set. This is a technical marvel! I also think it has just the right mix of reality and toy. 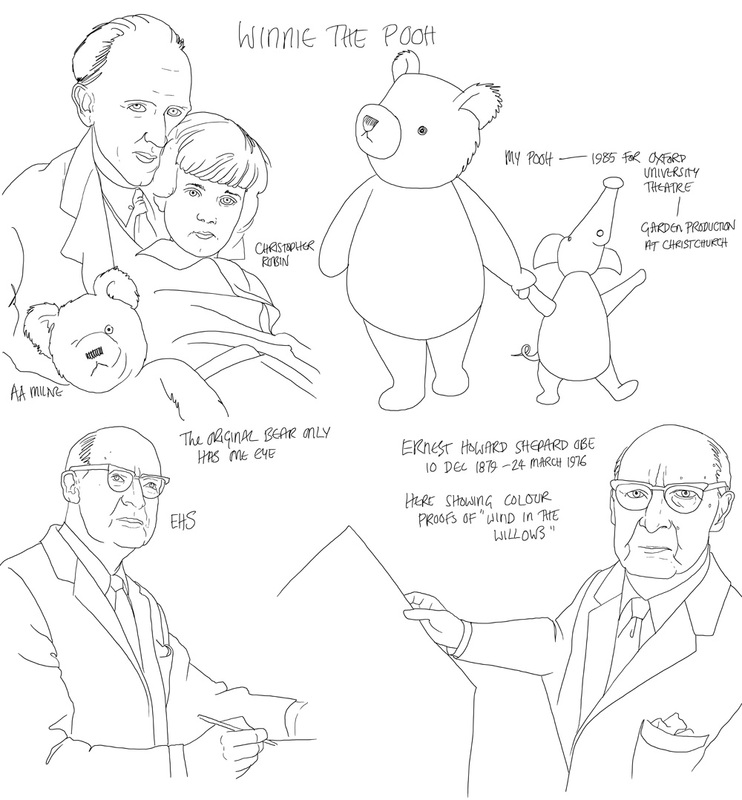 Disney should have done a live action/cartoon mix for their “Pooh” films of course…. Maybe one day. “Alice” calls out for the same sort of treatment. And lastly, here is a link to the Disney TV version- I am sending you to a Greek dub which might be amusing. It is certainly more fun than listening to the appalling dialogue in English! Here, as an antidote to all the above is a truly splendid pencil test of Owl. I am not sure who did it but it is stunning work!